In the run up to our Drill Session at Ryedale Folk Museum, we have decided to add a couple of articles about the nature of drill in the 18th century. Following on from where we left off last time, our recruits tells us he was ‘soon dismissed from the school of walking, and was put to learn the use of the firelock to face the monsieurs’. As discussed in our previous post we draw of drill from three sources the 1759 Treatise by Humphrey Bland, Cumberland’s Exercise of Foot 1757 and the Platoon Exercise 1757. The Manual Exercise is the exercise each soldier was expected to learn to enable him to move a firelock effectively. The First 26 consist of the positions each soldier would be expected to learn including the Shoulder, Rest, Poise etc. Each movement was governed by either the beat of the drum or a count of 1,2. It was only during the manual exercise that the ranks and files were to be opened. The distance between ranks being ‘6 feet or 3 paces distant and 1 pace or 2 feet distant in file spacing’ allowing the man to carry out the exercise unhindered. The 2nd part of the exercise was that of the Platoon Exercise, this exercise was perhaps the most important for in learning the platoon exercise recruits would learn to load and fire the firelock. Each movement again is to be carried out with a 1,2 timing. The quick and correct loading of the firelock being of utmost importantce in the heat of battle. It not being unheard of new recruits to load muskets repeatedly without firing a round only for the weapon to explode. This dexterity of carrying out these movements becomes clearer when consdiering the manual also states that in firing the files are to be drawn shoulder to shoulder and the ranks are to be one pace distant. In the run up to our drill session at Ryedale at the end of February we have decided to add some posts about the nature of drill in the mid 18th Century. In this respect we are lucky to have an anonymous first hand accounts of a soldier of the 68th who enlisted around the time the regiment was originally formed. The recruit is very detailed in various elements of his initial experience in the army and talks about a number of topics including messing which we may cover at another time. Within the first three days, the recruit was taken to ‘learn to walk’. We draw our drill from three primary sources, Humphrey Blands 1759 Manual, Cumberlands Exercise of Foot 1757, and the Platoon Exercise. Our recruit tells us that he did not ‘learn to use of a firelock’ until he had ‘learnt to walk’ and we can assume from these exercises what exactly the soldier was expected to learn. 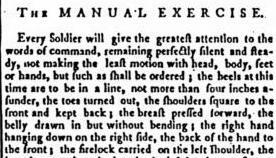 The First element of the manual exercise in each manual gives specific attention to the way a soldier was to stand. Almost all of the military treatise and manuals of the period, reinforce the need for the recruit to learn the nature of soldierly bearing; that is silently and attentively waiting for orders. To quote one Prussian manual of the period ‘until the clown is gone’. Of course a soldier was not only required to stand still, we can also assume that the art of walking would probably consist of the facings. Similarly since it was the art of walking we can also probably assume it consisted of marching and wheeling. Marching is particularly interesting as most British Manuals of the late 1750’s seem not to cover the art in any particular depth. Certainly Bland nor Cumberland give any indication as to what was the standard time, only that the drum, sergeants and officers should regulate it. Perhaps this was because it was obvious to those of the period exactly what the timing for the march was. We can however assume that each pace was in 2 feet, the regulation for the ‘pace’ between files and ranks being between 2/12 feet or 1/6 paces. The seven years war was of course not fought by British armies alone; and the army certainly did not exist in a vacuum or stand still in its development. The main ally on the continent was the Prussians, and certainly Prussian military fashions did rub off on the rest of Europe including its British Allies. Looking at a selection of manuals from just after the end of the war in 1763 we can see this affect, Wyndhams ‘Plan of Discipline for the Nofolk Militia’ certainly goes into great depth with regards to marching. 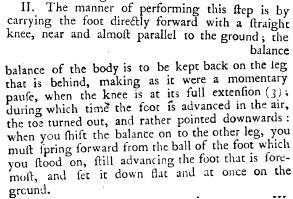 Wyndham gives us a description of ‘the old method of marching’ being ‘to lift up the legs and feet high, and make short steps, setting the feet hard down to the ground’. This certainly matches Cumberlands description of how troops are to march when opening the files in 1757. Wyndham goes on to discuss the Prussian step, ‘of late our troops, as well as those of other nations, have begun to practice the Prussian Step’. He goes on to discuss the length of the pace, being 2 feet as well as the time in which the step is regulated being one step every second. Wyndham when writing his manual in 1759 had the advantage of seeing two British regiment carrying out their maneuvers, being the 67th and 72nd regiments, perhaps it was these regiments he saw practicing the Prussian Step. Wydham was not alone in advocating the Prussian style, a Lt. Macintire who wrote a treatise on the training of Marines sent to attack on shore also advocates the Prussian style of cadence marching. Again as ‘practiced now practiced by some British troops’. Troops drilling in Quebec, shortly after its occupation by the British. 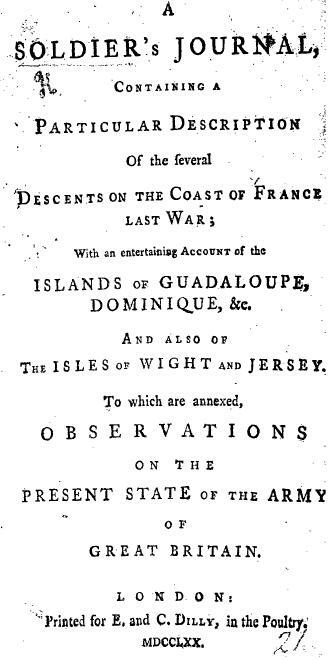 Of course both these manuals were written following the end of the war in 1763 and therefore can only point to the correct marching pace as practiced during the war. However if we look closely at the following print of British Troops shortly after the occupation of Quebec in 1759, it certainly appears that these troops are practicing what can only be described as the Prussian Step. The Prussian Step would go on to be universally accepted by British Troops in later years, certainly through to the Napoleonic Wars and beyond. However to what extend it was practiced by British troops is open to debate. Certainly the step was in use by some regiment by 1759.